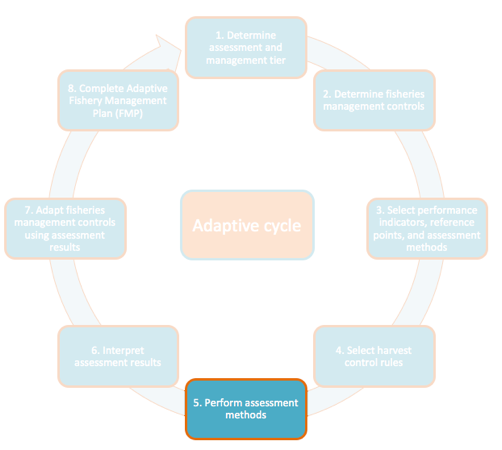 What do my assessment methods say about the fishery? During this step, you will use your data to calculate performance indicators using the chosen assessment methods. Refer to the assessment method descriptions under Step 3 for detailed descriptions of the assessment methods. To do the calculations, you may use the AFAM Toolkit dashboard. The dashboard includes data templates you may fill out using your own data to ensure all data are properly formatted for analysis. Alternatively, the dashboard also specifies the necessary columns for all types of data input, so you could also simply make sure your data has all necessary column names. Importantly, all column names must match exactly what is specified in the dashboard. If you do not have R installed on your computer, you should first install R and R Studio on your computer using these instructions. Next you will install the AFAM package onto your computer so that you can use it in R and R Studio. This is the best option and should be chosen if you have internet connectivity. This will install the AFAM package onto your computer from an online file sharing service (“Github”). This will ensure that your version of the app is the most up-to-date as possible. Note that this step requires internet connection. If you choose this option, simply copy and paste the following code into your R Studio console and run the code. This is the option to choose if you don’t internet connectivity, but do have a copy of the app file (this will be called something like “afamAppPackage_0.1.tar.gz”). This option will install the AFAM package onto your computer using this file. Note that this may mean you don’t have the most up-to-date version of the app as possible. If you choose this option, simply copy and paste the following code into your R Studio console and run the code. Note that you’ll need to change the working directory to the location where you have the app file. You now have the AFAM App Package installed on your computer! To use it, simply load the package, and run the app. You may copy and paste the following code into your R Studio console. Note that once the package is installed during the step above, you no longer need internet connectivity to run the app!